Thomas J. Pugh, MD, is a board-certified radiation oncologist specializing in cancers of the genitourinary tract, including malignancies of the prostate, urinary bladder, testicle, and kidney. He recently joined the University of Colorado as an Associate Professor in the Department of Radiation Oncology. Dr. Pugh moved to University of Colorado Cancer Center from the MD Anderson Cancer Center in Houston. 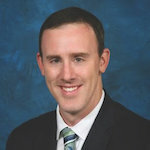 Dr. Pugh’s interests include advanced technology integration into cancer therapeutics, prostate brachytherapy, particle therapy including proton beam therapy, image-guide radiation therapy (IGRT), stereotactic body radiotherapy (SBRT), intensity modulated radiotherapy (IMRT), and integration of medical therapeutics, including chemotherapy and hormone therapy, with radiation therapy. His research has focused on improving quality of life and reducing side effects for men with prostate cancer. He is also involved in the development of cancer treatment clinical trials for patients with genitourinary cancers. Dr. Pugh is an internationally recognized expert in genitourinary cancer and has served in numerous leadership roles on multiple ASTRO, ABS, and RTOG/NRG committees. He has served as principal investigator on several institutional and national clinical trials, including: MDACC 2012-1003; MDACC 2012-1013; RTOG 0815; RTOG 1115; and MDACC 2013-0555. He has published over 100 peer-reviewed articles, abstracts, and book chapters. Thomas J. Pugh, MD, provides an overview of next generation techniques, especially prostate brachytherapy, to refine dose escalation and differentiation, as well as the therapeutic ratio, for ablating localized prostate cancer. Thomas J. Pugh, MD, summarizes the evolution oligometastatic prostate cancer management, the current definition of the oligometastatic state, and clinical trials for using stereotactic radiation therapy (SBRT) in this setting.